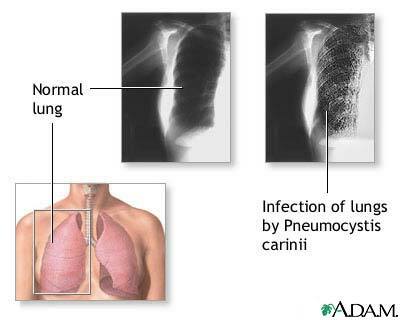 Pneumocystosis is an infection of the lungs caused by the microorganism Pneumocystis carinii. Pneumocystosis is almost exclusively seen in individuals whose immune systems have been compromised by AIDS or chemotherapy. Pneumocystosis is usually a terminal event in AIDS patients. Updated by: David C. Dugdale, III, MD, Professor of Medicine, Division of General Medicine, Department of Medicine, University of Washington School of Medicine; Jatin M. Vyas, MD, PhD, Assistant Professor in Medicine, Harvard Medical School, Assistant in Medicine, Division of Infectious Disease, Department of Medicine, Massachusetts General Hospital. Also reviewed by David Zieve, MD, MHA, Medical Director, A.D.A.M., Inc.